“Got a feeling I’m a robot…” The longing in Julie Hardy’s voice is palpable. It’s a gorgeous voice, filled with warmth and pain, seemingly in contrast with the icy synths and computerized sounds that lurk behind her heartache. But within Clementine & The Galaxy, these two worlds meld together just fine. 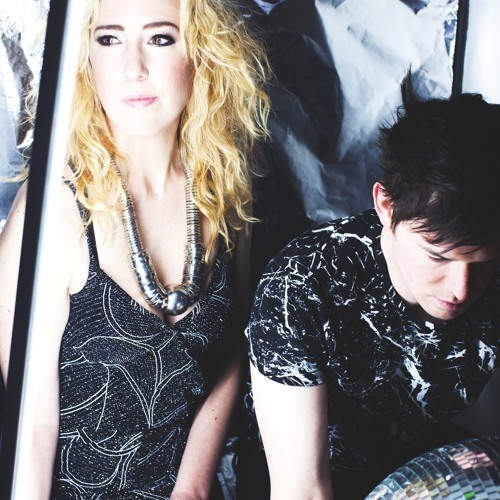 A retro/futuristic spin on pop, the Brooklyn duo craft evocative electro sounds with a human heart. Hardy may sing “I’ve been programmed not to miss you,” but it’s her soulfulness that propels the whooshing synths and cinematic flourishes of her bandmate/partner Mike MacAllister. Think the grand drama of St. Vincent, a sprinkle of Bowie’s stardust. Electro-pop gems with a mod sci-fi motif. Clementine & The Galaxy officially debuted in 2011 with the release of the single “Crying My Whole Heart Out.” Word spread quickly. The duo garnered a feature in Interview (“a pop duo with their hands on synthesizers and heads in the cloud”) and praise from Time Out New York (“Spacey, playfully proggy art pop in the Bowie lineage”). Since then, they’ve released a self-titled EP, a well-received cover of Nirvana’s “Heart Shaped Box” and a popular remix of Big Data’s “Dangerous,” among several others. This year, Clementine & The Galaxy will unveil their second EP, Midnight Machine, released by Jillionaire of Major Lazer’s Feel Up Records. The songs on Midnight Machine are equal parts heartbreak and uplift, the cool alienation of “Robot” contrasting with the upbeat, anthemic “Can’t Knock Me Down” and the slow build of “When the Night is Over” (which you may have heard gracing a Victoria’s Secret ad). It’s a complex, multi-faceted pop affair. Before the release, the duo is gearing up for the road, including appearances at this fall’s CMJ. Live, the group features Hardy on vocals and synths, MacAllister on guitars, and a drummer. “We used to have a larger live band, but we decided to simplifying things. And I’m playing keys again,” says Hardy. They continue to write new music as well: C&TG is prepping another set of material for next year, a more collaborative affair, including songs written with members of Cobra Starship and Sally Seltmann, the co-writer of Feist’s “1234.” Says Hardy: “It’s different, but we’re still just writing music we like. I’m feeling really good about it.” This grand union of Hardy and MacAllister sprung from unusual beginnings. Hardy began her career as a singer-songwriter, but one who’s found her talents used far and wide: as a back-up singer for Ellie Goulding on Saturday Night Live. Performing with St. Vincent on Letterman. A smattering of guest vocals and ad work. MacAllister, meanwhile, was writing film scores and commercials. “We had this one gig in common. Before that we didn’t know each other,” says Hardy, laughing. “It was an incredibly strange gig that our mutual friend found on Craigslist. I had to sing a bunch of hymns in different languages and Mike was the engineer. We did it four years in a row.” Intrigued by MacAllister’s producing work, Hardy asked about collaborating. “I was performing at the time as Clementine. Then I started working on these new songs that were a real departure,” Hardy says. “It begged for a more electronic sound. So Mike and I started working as a team.” As their sound quickly gelled, “The Galaxy” was added to Clementine’s moniker. “What I like about the band is that we have so many unique, hybrid elements about us,” says MacAllister. “We’re constantly experimenting, hearing our sound change and grow.” Nothing robotic about it.